I caught Gyroscope from fellow kiwi Owen Williams tweeting about it, then joined after chatting with my friend John Gleeson. We were both chatting about tracking apps, to get a better view of our days and where we could improve. Both active people and wanting to keep that way. What I really like about Gyroscope is that it lets you pull in multiple data sources, I pull in productivity from RescueTime, Heartrate from Apple Watch, Location from Moves (and now the Gyroscope beta). What I like, is where It overlays the two, below is heart rate, whilst it’s detect I’m at the gym – and it’s contextualized it for me over the hour. When I first saw this, I realized, my heart rate isn’t getting high enough consistently at the gym, so it’s pushed me (again) to raise the bar. 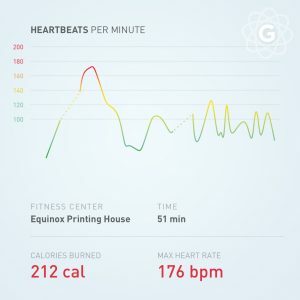 I’m excited to hear, that maybe heart rate variability will come in, which will help give me a better view of my body state, and whether I should push through, or prioritize rest today. A gentle nudge if you will. That’s not the only use, you can set goals, pull in weight data, mindful minutes, sleep. I don’t collect sleep as I’m working on, not having the phone in the bedroom. You might ask, what’s the benefit over Apple Health? I think the lens is different. This is a complete picture of your life and what you’re focused on. Apple Health is more direct health data. Both useful but in different ways. In fact Gyroscope will pull from Apple Health when it can. I think what they’ve really got right, is making all of this data, playful, relevant and customizable. What would I like to see in the future? Comparisons against a specific friend (you know, we’re competitive). Re-energising time, things that feedback back in to the system. More advanced options, for form, heart rate data. Insights & decisioning. Even if biased or beta. Greater control around the vault (where data is protected). Ability to export/encrypt for safekeeping. Nutrition/calorie intake. (Why? Once have made the change, found it sticks). More goal data. (I see this as ongoing, less of a specific goal, personal choice I guess). Weather context, temperature, humidity, wind. Experimentation mode, i.e. note a variable change (can be outside of the app), and it compares against an anchor variable, heart rate/variability etc. For example I could try to ‘stop drinking coffee’ and see if there’s a noticeable impact, where/how. Deep work – and also quality of work. Maybe an Evernote integration. Give it a try, let me know your thoughts. Would also love any recommendations you may have @bwagy me. This entry was posted on Wednesday, February 21st, 2018 at 3:19 pm.